The James Burn BB50H finishes documents and calendars up to 20″ wide, with variable output of 600-1200 books/hour. It can skip bind and includes a central hanger feed system which can be disengaged. The BB50 automatically finishes hand fed pre-punched documents with Wire-O® sizes from 1/4″ up to 1″, using traditional spools or our patented Snake Skin Wire in 3:1 and 2:1 pitches. 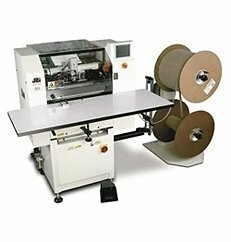 This machine is easy to use because it automatically cuts wire to length, feeds and positions wire for insertion and finishes hand fed pre-punched documents and calendars. The size, pitch and format changes are easily controlled from the user-friendly ‘Touch Key’ pad. The BB50H is an operator-friendly machine with a large table-top working surface which helps reduce fatigue! If you have any questions or are interested in purchasing the BB50 High Speed Wire-O Binder, visit us at SpiralBinding.com. We have great pricing on a full line of Automatic Binding Equipment. Call us at 1-800-631-3572 for more information!